Events of 150 years ago this week evidenced the gradually changing views of Abraham Lincoln toward the issue of slavery and emancipation. Clearly this was an all-encompassing thought process for the President during these troubling and difficult times. He was becoming more bold and assertive and definitive in his thinking with each passing day. I intend no reproach or complaint when I assure you that in my opinion, if you all had voted for the resolution in the gradual emancipation message of last March, the war would now be substantially ended. And the plan therein proposed is yet one of the most potent, and swift means of ending it. Let the states which are in rebellion see, definitely and certainly, that, in no event, will the states you represent ever join their proposed Confederacy, and they can not, much longer maintain the contest. The incidents of the war can not be avoided. If the war continue long, as it must, if the object be not sooner attained, the institution in your states will be extinguished by mere friction and abrasion–by the mere incidents of the war. It will be gone, and you will have nothing valuable in lieu of it. Much of its value is gone already. How much better for you, and for your people, to take the step which, at once, shortens the war, and secures substantial compensation for that which is sure to be wholly lost in any other event. Though the congressmen of the Border States listed politely and responded most respectfully, they turned down the President by a vote of 20-8. President Lincoln was riding in a carriage to the funeral of the infant son of Secretary Stanton, and he was seated with Gideon Welles and Seward. He rather startled his carriage-mates with a discussion of his thinking and intent toward a statement on total emancipation. Speaking of how these thoughts had been heavily occupying him for some time, he spoke of the frustration of expecting the Border States to act on their own, of the way the Confederacy had forced the issue toward such a resolution, and of the War necessity to act – thus setting the example for the military of striking a blow at the very heart of the rebellion. President Lincoln presents to Congress another plan of gradual emancipation. Those states agreeing to emancipation would receive federal bonds as compensation. If a state chose immediate emancipation, it would receive all its federal bonds at once. If the state chose gradual emancipation, it would receive its bonds in installments. This would, of course, not pass. 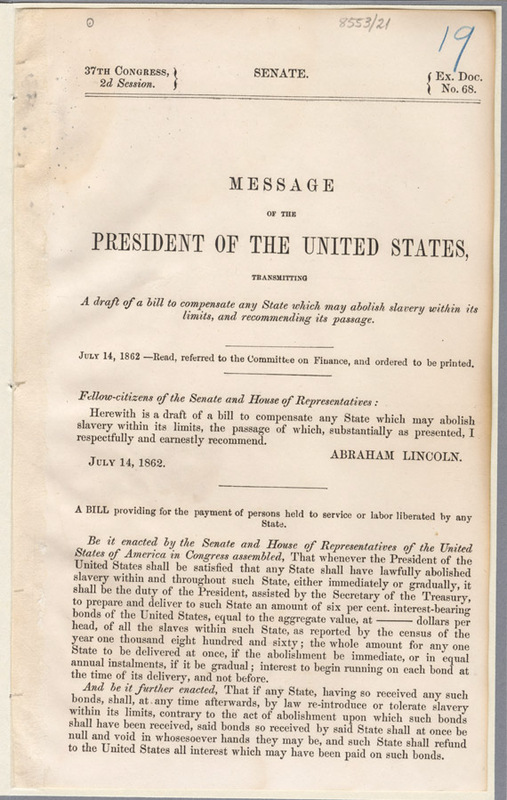 Posted by Randy Buchman on July 14, 2012 in General Civil War Themes, Sesquicentennial Series and tagged Abraham Lincoln, Emancipation, gradual emancipation, slavery.